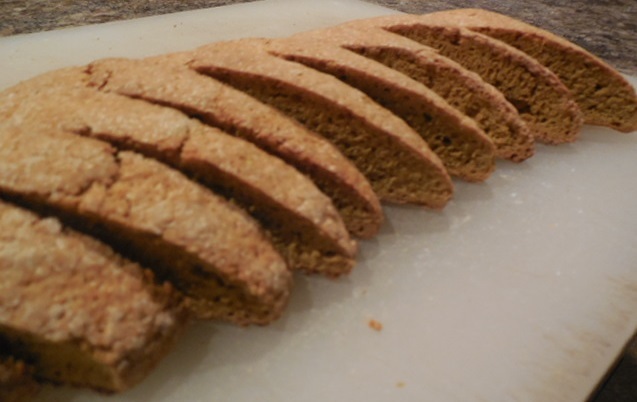 These pumpkin biscotti are crunchy cookies, perfect with a hot cup of coffee on Chi tea on a cold November night...... or day for that matter! Spiced with cinnamon, nutmeg, ginger, and cloves they will remind you of pumpkin pie. They are and excelent additon to the Thanksgiving Dinner desert ensemble. This recipe is flexible and welcomes the addition of toasted pecans or dried cranberries. Or..... if you want to be indulgent, drizzle with a bit of white or dark chocolate. If you don’t have all the spices on hand, but have pumpkin pie spice, substitute about a teaspoon and a half. Position one of your oven racks in the center of your oven and preheat to 350 degrees F.
Line a baking sheet with parchment paper or a nonstick baking liner and set aside. In a large bowl, sift together the flour, salt, sugar, baking powder, and spices. In another bowl, whisk together the eggs, pumpkin purée, and vanilla extract. Pour the pumpkin mixture into the flour mixture. Give it a rough stir to generally incorporate the ingredients, the dough will be crumbly. 7. 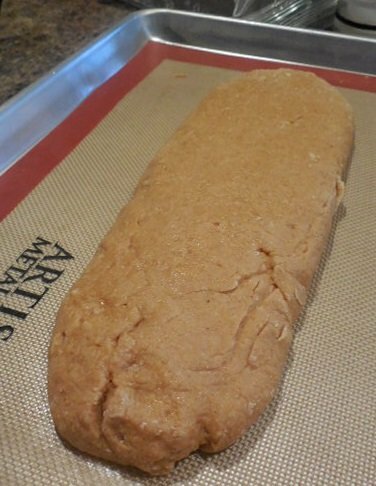 Form the dough into a large log, roughly about 15-20 inches by 6-7 inches. The loaves should be relatively flat, only about 1/2 inch high. 8. Place on baking sheet and place in oven for 22-30 minutes, until the center is firm to the touch. 11. Using a serrated knife cut into 1 inch wide pieces, place on baking sheet and return to oven, baking for an additional 15- 20 minutes. 12. Remove from oven and cool completely. 13. Biscotti may be still a tad moist and chewy, because of the pumpkin. 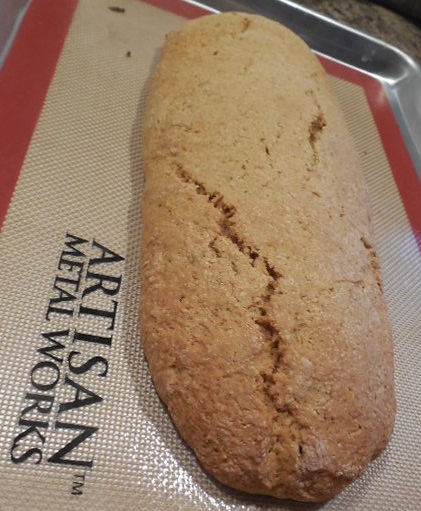 If you prefer it crisp, turn off the oven and leave biscotti sit overnight. Before using your herbs and spices, use your senses to determine freshness. As a general rule, ground spices that are older than six months should be replaced. More on Herbs and Spices. If you enjoy baking and want to make the best you need to use the finest ingredients you can afford. Spices, like other ingredients, price often equals quality, so buy the best you can afford. I buy a lot of my herbs and spices on line, because the quality is superior to store bought. One of my favorite herb and spice providers is the Olive Nation. To check them out click here.